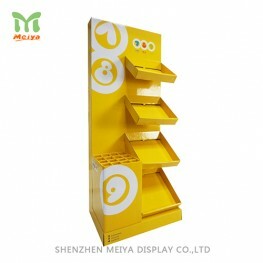 Shenzhen Meiya Display CO., LTD. was established in 2005, specializing in various kinds of cardboard displays. Our product range includes Cardboard Display Stands, Cardboard Floor Displays, Counter Top Display Stands, Hook Display Stand, Dump Bin Display, Cardboard Pallet Display and so on. We have certified by the ISO 9000 and with our continuing pursuit of integrity, innovation and excellent, we have won the trust of our customers all over the world. Our Cardboard Display Stands are quite popular in the international market. We have long-term business relationship with big names like Walmart, Disney, P&G, Hello Kitty, Carrefour, Nestle and many more. We offer one-stop service, including bespoke design, complete solution of cardboard displays according to individual customer’s requirement, manufacturing and shipping. So we can fulfill the demand of our customers and got a lot of inquiries every day. Today we would like to share some with you. Message: Hello, we are looking for good quality of Cardboard Display Stands. 100 units probably are good to start. The size is 13,78*27,55*66.29. Please give us the quotation. Message: Hello I need a sample of this Cardboard Display Stands made with my logo and artwork specifications made. Is this possible? I am looking to purchase in large order of 1000, and I need to be sure you can deliver the quality that I need. I have attached the link of the product that I need. Message: I like this display http://www.meiyaprinting.com/shelves-cardboard-display-stands-removable-header-p-69.html and was wondering if you have a 6 shelves option? Let me know. Thanks! Message: Hi, i would like to get a quote for the Cardboard Display Stands. I have a custom artwork for the front header and both sides. Please let me know the quote, production time, and if you have any further questions. Thank you. Message: Hi there, just inquiring about the 3 shelve counter display, would we be able to customize this to add a circle hole for a bottle? And what is the cost per item? Thanks, Kate. Message: can I get this 4-tier promotion cardboard display in a sample with my artwork design specifications? If I feel the sample is ok, then I will place a large order later on. I hope to hear from you soon.